The oldest colt of Favorito de la Parra, Favorito KG, born in 1998, is black bay and stands 16.3h. Favorito KG combines the bloodlines of Paco Lazo (from his sire) and Escalera (from his dam.) In Spain, this bloodline combination is known for producing excellent horses for competitive sports. 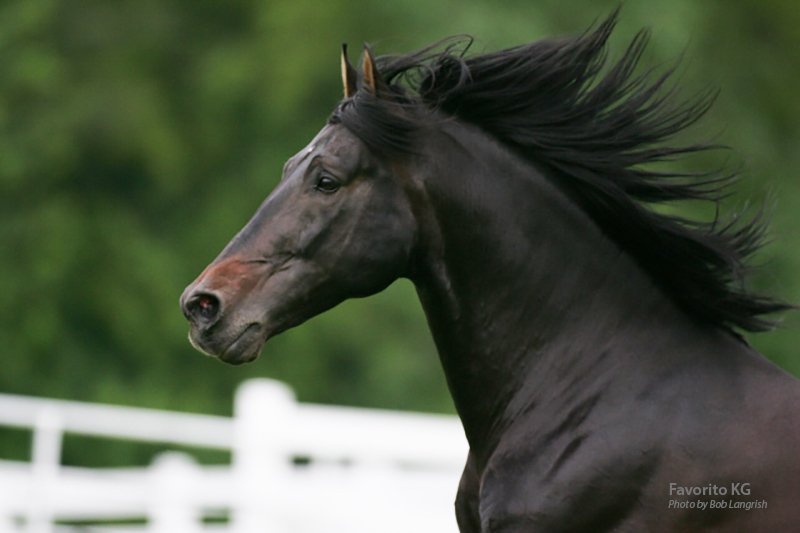 Favorito KG's straight profile and huge bone come from his maternal grandsire, the black Andalusian stallion Dejado. Dejado was a favorite subject of the photographer and author, Robert Vavra, and is featured in several of Vavra's books. At the 2005 Eastern Regional Show, Favorito KG was the Reserve Champion Senior Spanish Stallion. The Spanish judge was particularly pleased with his gaits. Favorito KG was shown in dressage in Florida during the 2004 winter season. Although Favorito KG did well in dressage and was scored highly for gaits and impulsion, he seems to have an aptitude for jumping. He had a clean round at a local show after not having jumped a full course in 5 months. Favorito KG has proved to be a very prepotent sire producing offspring with his movement, bone, beauty, height, color and sweet temperament.